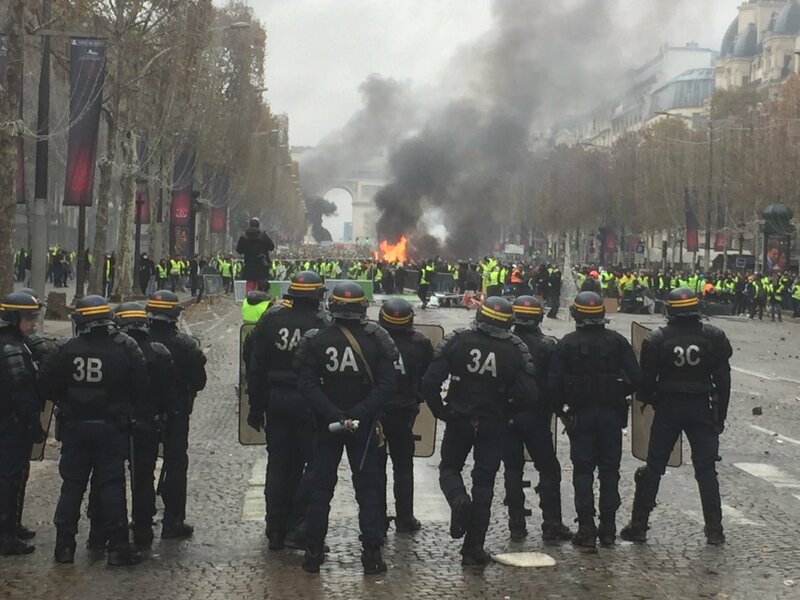 Days of protests in France over fuel tax increases have turned into days of RIOTS which have become so bad, French Police are asking for the ARMY to be deployed, calling the situation "a Revolution." Protesters are all wearing Yellow Safety Vest jackets, which all French car owners must have by law, to wear if their car becomes disabled and they need help on a highway. The protesters are thus being referred-to as "Yellow Jackets." Cars and buildings throughout Paris have been burned, police have been violently attacked and now, French citizens have actually brought out a Guillotine! French government officials are actually in fear they may have their heads cut off by the mobs. French Leader Macron has, this morning, suspended the fuel tax increase, but things are getting much worse. A social media posting says December 10 is the day they take nationwide action against the government. "Nous nous adressons à la population, c'est le calme avant la tempête !!! Faites des provisions, de l'essence /gazoil, faites le pleins en nourriture et médicaments !!! Nous allons tout bloquer dès le 10 décembre !!! Nous nous arrêterons quand se que nous demandons sera réellement mis en place !!! Assez de nous prendre pour des cons !! Nous voulons vivre et non survivre !!! Rejoignez nous le10 décembre !! Aucune école, aucune administration ! Ouverte !! Aucun magasin !! Nous bloquerons les accès et sorties d'aéroport ! !les grandes surfaces ! Les bureaux !! La Srpp !! Nous prévenons la population !!! Rejoignez nous au différents barrages ou restez chez vous ! Nous les GJ sommes non violents et ne voulons pas que de belles paroles mais des actes !!! LE 10 DÉCEMBRE TOUS ENSEMBLE !!!! In the most recent elections in France, the people had a decisive choice: Emmanuel Macron or Marine LePen. They chose Macron and have now gotten EXACTLY what LePen told them they would have during the election! It's the people themselves that wanted Macron. Now they're all upset that he's doing exactly what he said he would: Spend more. Well, in order to spend more, he has to tax more - and suddenly, the French are up in arms. Anyone but not Le Pen. There is no way to prove that the election was rigged. The general concensus in the population was "No Le Pen" at the time. They would have voted anyone, Macron, Mellenchon, or anybody else. The Yids media manipulation worked full blast. No doubt there are many Godless sheeple in France. They're reaping what they sowed. Chicken coming home to roost, again. However, the French election was likely rigged by the treacherous Jews to ensure Macron's "victory" over nationalist Le Pen, hence, furthering France as a significant cog in the Jew World Order. No doubt there are many Godless sheeple in France. They're reaping what they sowed. Chicken coming home to roost, again. However, the French election was likely rigged by the treacherous Jews to ensure Macron's "victory" over Le Pen, hence, furthering France as a significant cog in the Jew World Order. Why are some of this forum's members incapable of accepting defeat every time an election that is not in your candidate's favor happens? If you get to the second round in France, you're a decent candidate. 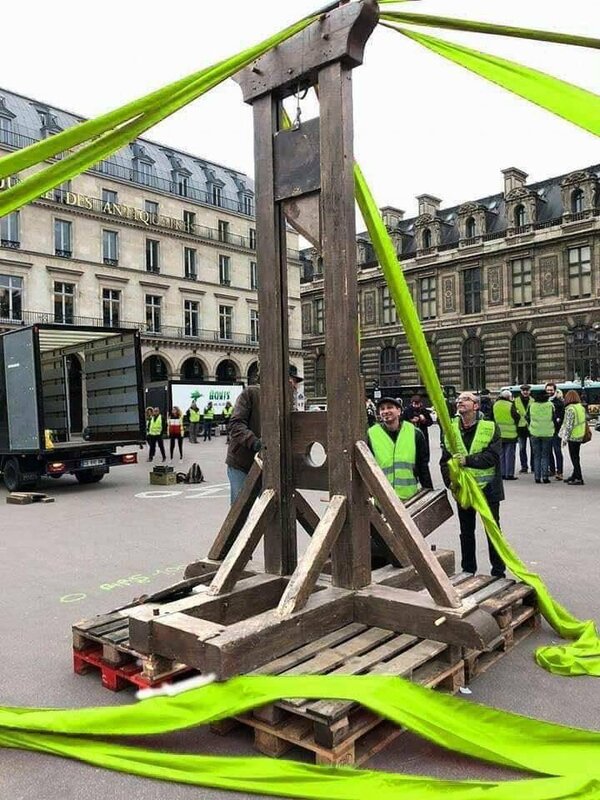 And from a French source, the guillotine picture is shopped. All it requires is a Google image search to tell you that. I didn't know that the (guillotine ) picture was a fake. Sorry about that! It was attached to the article. Not every time. However, the sheenies have a history of rigging elections that are of national and global importance to their agenda. The Hillary camp was involved voter fraud and rigged votes in the 2016 election, but she still lost because "white hats" in the Deep State prevented her from electronically falsifying enough "results" that would've given her the election. Look up what independent reporter, Greg Hunter, has brought to light on this matter. *white hats are the good guys in the Deep State who countered the hackers and rigged election machines. The Deep state is not all bad guys. There is a soft civil war occurring between Judeo-masonic shills and patriots in the Deep State. You of all people should know that rigged elections and voter fraud are real. You live in Florida, right? Are you completely absent-minded to not know about the great communist ape, Brenda Snipes, orchestrating the latest fraud during the midterm election in Broward County? Yes, some elections are absolutely rigged, that's no doubt. I'm just saying that they're not all rigged. All the elections that don't go the way I think they should go are rigged. Why don't they have any gooks in 3D? 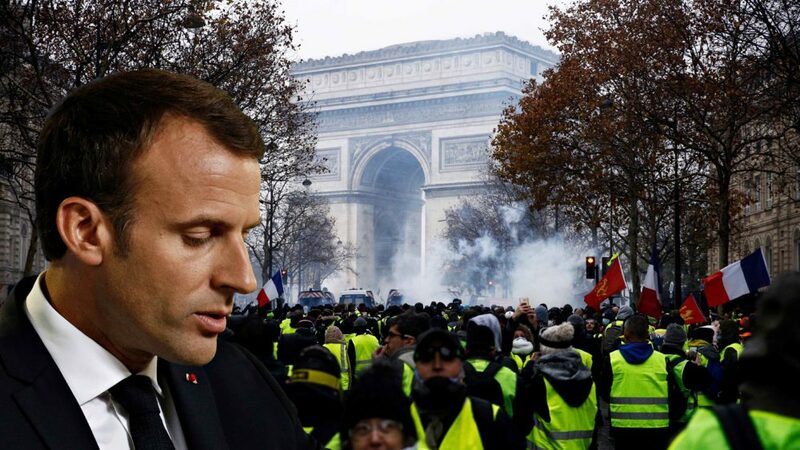 The "yellow jackets" protesting are basically the indigenious ethnic French who've just about had enough of Macron and the elite in France pushing turd world immigration on them , compliments of the jew world order. I don't know if it's enough for real regime change there, but it's a good start. Nationalism has finally caught fire in Western Europa like it has in the East for some time now. There is a real showdown coming in the British Isles over this Brexit nonsense, or should I say, the resistance to it by the elites over there as well. The Scandanavians are beginning to awaken the Viking spirit as well. Italy has a nationalist in charge there now.The Greeks have been resisting for many years with party's like Golden Dawn.The Polish are once again Catholic and nationalist.So is Hungary.And we all know Putin and Russia is enemy #1 for refusing to submit to the jew controlled West. All of Europe is a powder keg over this immigration issue, as it's native inhabitants realize that they are fighting for their very existence. The U.S. will not be far behind in the not too distant future. I believe, France is pivotal. It always has been. As France goes, so goes the rest of the West. The jew is not happy that the frogs are resisting, outside of the Germans these days, the French have been their favortie whipping boy in Europe for some time now. They will not go easy on the French whites who will not go out quietly. Look for drastic measures by the gov't to quell them, unlike the kid gloves they use on the muzzies and Africans when they basically try and burn the country down and attack the native French.This will give them an excuse to carry out what they've been trying to do to begin with: Genocide the ethnic, white Christian French people. The Camp of Saints is beginning in real time as we see it. May God and our Blessed Mother give them the strength to prevail. Now is the time for real Crusade within their own borders. Now is the time to revive the Templar war cry! A no-confidence vote against Macron may come on Monday. It's by the left-wing parties mostly, but it's a start. Snap, Crackle, Pop! The Liberal Order Cracks. Yellow-Vest Revolt in France Rebels against Macron as Embodiment of the Liberal Order. Will Liberal Modernist NewChurch be Next? Dr. Chojnowski: Follow the link below to a fantastic article by the well-connected Russian philosopher Alexander Dugin entitled, "Uprising in France --- The Anatomy of Populism and Challenging the Matrix"
Dugin here describes the cracking of the Liberal Order, transcending the post-revolutionary distinction between left and right. Now the discontented people --- searching after human normality --- rebel against a Rothschild protege --- who publicly identifies himself as a Freemason, who have always been the front line of the Liberal Movement creating a world which Dugin rightly describes as one of Liberal Totalitarianism. Hopefully, after the fraud and criminality of the Vatican II sect is exposed for the world to see --- hopefully the world cares --- perhaps true believers will take to the streets also and demand truth and take their Catholic institutions back. Here is the Link. Alexander Dugin originally published his article on RT (Russia Today).